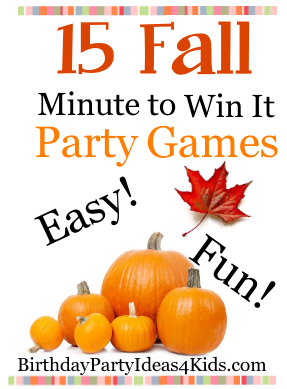 We’ve listed our 15 favorite Fall / Autumn theme Minute to Win It style games on the website this week. These games use ordinary household items to create a great deal of fun for kids, tweens and teens. Easy, Fun and Cheap entertainment for Fall birthday parties, family get togethers, family reunions or any time you want a challenge and some fun! We also have over 200 Birthday Party Themes to search though if you are looking for a fun and unique theme for your next birthday party. Birthday Party Ideas 4 Kids … let’s get the party started!